The liberty cap was the symbol of freedom and liberty commonly used in the 19th century and is seen in many places in the United States Capitol. This soft cap evolved as a combination of two earlier symbolic head coverings. The peaked red Phrygian cap was worn in present-day Turkey as early as 800 B.C. and was seen as a mark of free men in classical Greece. The ancient Roman conical cap called a pileus was placed on the heads of emancipated individuals – who, as slaves, were not allowed to grow their hair or wear a cap – and is often depicted along with a special rod that was used in the ceremony of manumission, when slaves were formally emancipated. Centuries later, the freedom cap appeared in images during the American Revolution and was used in American art and coins in the early 19th century. It was most popular during the French Revolution, when it was called the “bonnet rouge” and was worn by revolutionaries and depicted worn or held by a female figure representing Liberty. One of the places that the freedom cap surprisingly does not appear is on the head of the Statue of Freedom atop the Capitol Dome. Although architect Thomas U. Walter’s first drawing for the Dome included a sketch of Freedom holding the pole with the liberty cap, the statue as completed includes no symbols traditionally associated with freedom or liberty. Thomas Crawford, the American sculptor commissioned to create the Dome’s statue, did propose a female figure wearing a liberty cap in his second design, but Captain Montgomery Meigs, who was in charge of the construction of the Capitol extension and new Dome, rightly feared that his superior, Secretary of War Jefferson Davis, would not like it. Davis had previously objected to the liberty cap that Crawford had placed on the head of the central figure in the Senate pediment on the East Front of the Capitol. In a letter dated April 20, 1854, Meigs wrote to Crawford describing Davis’ thoughts on the cap, “He says it is the sign of a freedman and that we were always free, not freemen, not slaves just released.” At this time when debates over slavery were heated, Secretary Davis, a slave owner himself and future president of the Confederacy, was well informed about the history of the symbol. Despite Davis’ objection, Crawford’s design was not changed, and the liberty cap can be seen over the Senate entrance today. 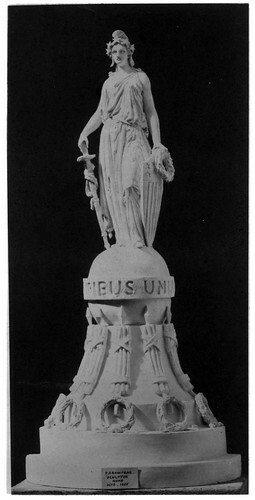 Thomas Crawford's second design for the Statue of Freedom. Almost two years after seeing the pediment sculpture design, Secretary Davis was shown the photograph of Crawford’s second maquette (small preliminary model) for the Dome statue (right). He again objected to the liberty cap in a letter to Meigs, expressing concern that the cap did not appropriately represent “people who were born free and would not be enslaved.” He went on to suggest that a helmet would be an appropriate figure of Armed Freedom, but ended his letter by leaving “the matter to the judgment” of Crawford. The sculptor diplomatically created a helmet with a crest of an eagle’s head and feathers, noting that it was “suggested by the costume of our Indian tribes” to replace the traditional liberty cap. It is interesting that Davis appears to have expressed reservations about the use of the liberty cap only in exterior works of art. He had no objection to Constantino Brumidi’s figure of Freedom with her red cap in multiple locations, including the Senate Reception Room. After Davis’s term as secretary of war ended in March 1857, Brumidi continued to paint figures of Liberty with the red cap in his murals throughout the Capitol including in the Brumidi Corridors (in the scene "Bellona"), the Senate Reception Room, the President’s Room, and in the Rotunda’s Apotheosis of George Washington (seen at top of page) and the Frieze of American History (in the scene "America and History"). The cap can be seen in other places throughout the Capitol as well, including on early marble mantel pieces, in the House bronze doors designed by Crawford, and in the Amateis Doors and Minton tiles.